With her 25th book, lifestyle philosopher Alexandra Stoddard offers simple steps for taking charge of your life—your way. 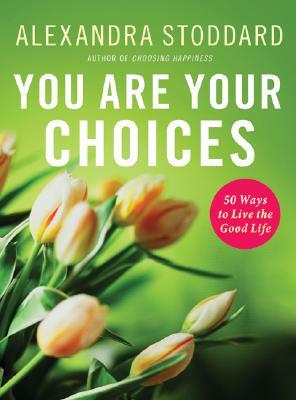 In brief essays filled with useful examples and optimism, she reveals 50 choices you can make to live joyfully in pursuit of what is true, good, and beautiful. Her essays help us trust ourselves ("Intuition is your guiding light"), stay steady in a storm ("Your choices count most in a crisis"), embrace the new ("Accept opportunity"), address unfinished business ("Have as few regrets as possible"), surround ourselves with delights ("Redefine what is beautiful"), and remember to have fun ("Cheap thrills are thrilling"). As a pioneering writer and lecturer on personal happiness for the past twenty years, Alexandra has inspired millions to break the "rules" and pursue fulfillment. Now, as scientists have begun to discover the benefits of living a happy life, Alexandra provides practical ways to live happily every day. She puts us in charge of our choices, reminding us that we always have a choice about what we think, feel, and do. When we are true to ourselves, we can fly above stress and conflict, contented and confident that we are the right path. Every choice you make is an opportunity to delight in life. You Are Your Choices offers insight and companionship each step of the way.